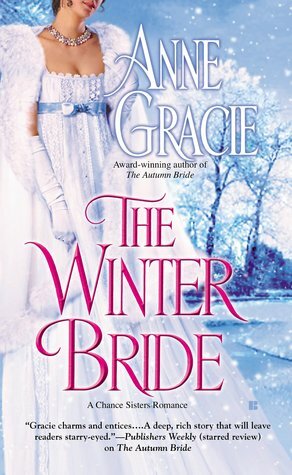 The Winter Bride is the second book in the Chance Sister series, and I was really looking forward to reading it. I enjoyed The Autumn Bride a great deal and was excited to learn more about the Chance Sisters, but unfortunately I was left wanting. This book had tons of potential but fell flat in my opinion. Both of the main characters, Freddy and Damaris have tons of internal conflict and heavy baggage from their past which would have made for fantastic internal dialogue or reflection, but instead we are given only snippets of their issues until the very end, and then it is Damaris who tackles the issues for both of them. We never really see Freddy stand on his own two feet and face his issues which made me sad. He is clearly a strong and likable character and is completely capable of taking the bull by the horns and facing his own issues yet he doesn’t, and I think letting Damaris handle it all felt like a weak out. Damaris is a sweet, unassuming likable character with her own hard issues, and I would have liked to have seen those issues dealt with in a more compassionate manner. Her strength is clear throughout the novel, but I would have liked to have seen more of her vulnerability with those she loved and trusted throughout the book, rather than having it crammed into a few chapters at the end. Overall, The Winter Bride is a completely predictable, albeit sweet, historical romance. The chemistry between the characters is clear, the settings are lovely, and the conflicts are moving. It just needed a little more of something. It lacked the warmth and banter of The Autumn Bride among other things, and while I realize we are dealing with different characters, every time Freddy would try to engage in some verbal sparring, Damaris left it flat, which left the novel feeling flat for me. It wasn’t a bad read it just wasn’t great, and that’s why it is getting a B- grade. It wasn’t average b/c the struggles were intense but it wasn’t a huge page turner for me either. I hope the next one in the series is less predictable and more fun to read.